You are here: Home / TOASTER OVEN BASICS / What Are The Best Toaster Oven Pans? 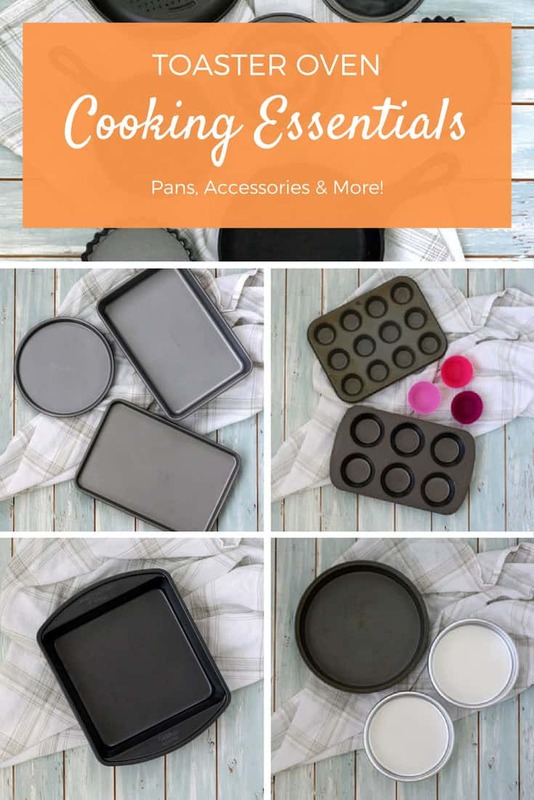 Inside: Discover the best toaster oven pans for creating dishes so delicious no one will believe you cooked them in a tiny toaster oven! Hey, Friend! I’m Brie, one of the cooks at this toaster oven lovin’ website. Our goal here is to help you enjoy your little oven and feel confident cooking more than toast! To make things easier and answer all of your questions, we’ve put together a list of the best cook-better-tasting-food essentials for your toaster oven. We want you to enjoy your toaster oven safely so the first thing to do is to read your toaster oven’s manual and follow it’s directions and recommendations. No worries, most major manufacturers offer appliance manuals as free PDF’s on their company websites. Just Google your toaster oven’s manufacturer name and the model number. If you still can’t find yours send me an email: toasterovenlove[at]gmail[dot]com including the manufacturer and style of your toaster oven and I’ll help you hunt it down, promise. All ovens (big and small) can have unreliable temperature settings. The best way to combat a fussy toaster oven is with an inexpensive thermometer. We paid $7 on Amazon for ours. 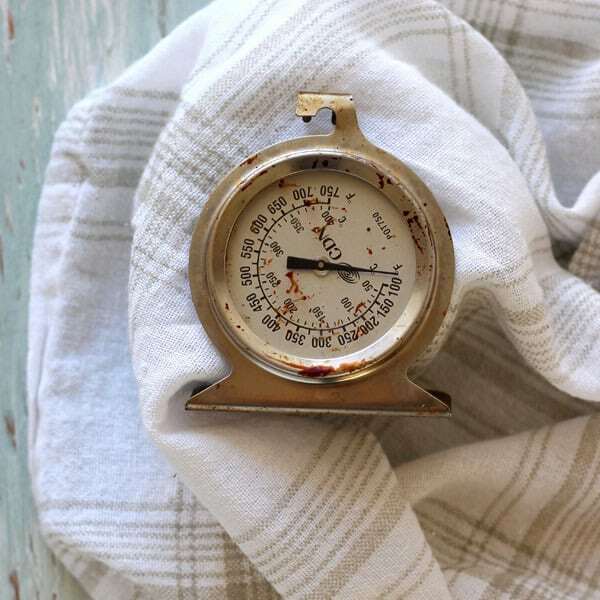 Look for thermometers that have a steady base and/or the ability to hang. Check out our Toaster Oven Temperature Guide for step-by-step directions on using a thermometer to find out how accurate your little oven is. Most toaster ovens come with at least one baking sheet or roasting pan. Sometimes that pan and a few reliable recipes are all you need to cook something delicious. If you want to use your toaster oven for way more than warming leftovers and cooking Pizza Bagels you’ll eventually need to add an extra pan or accessory to your arsenal. Below are all of the toaster oven pans that we use along with tasty recipe recommendations. Where Can You Purchase These Pans? Many of them can be found at your local department and home goods stores. If you’d like to purchase them online at Amazon there are orange affiliate links included for many of the pans and accessories. If you can have only 1 additional pan for your toaster oven make it an 8 x 8 baking pan. It’s a great all-purpose pan that can be used for any recipe, from casseroles to brownies. We’ve used our Wilton 8-inch Square Baking Pan to make a Lemon Blackberry Baked Pancake, roast veggies and even bake a small batch of Blueberry Banana Oat Cookies in a pinch. What about casserole dishes and glass pyrex? Those are a little trickier, check out our post for 4 Surprising Things You Should Never Use In A Toaster Oven for more information. 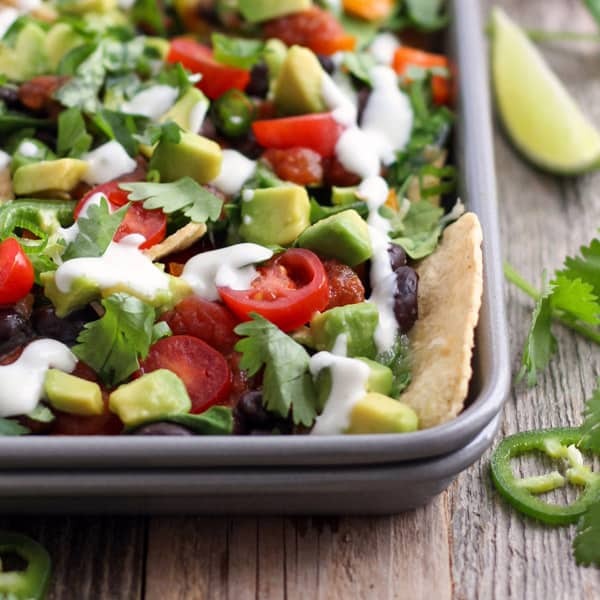 If you already have an 8 x 8 pan, a sheet pan should be next on your list. With a thick and durable sheet pan, you can bake cookies, roast vegetables, make crispy Buffalo Broccoli and Cauliflower Bites and with the help of an oven-safe baking rack cook an Ultimate Toaster Oven Baked Potato! Heavy Gauge Metal – thinner pans tend to warp at higher temperatures and cause the bottoms of delicate items likes biscuits and cookies to burn. If your toaster oven is large enough to fit a quarter sheet pan (like the Breville Smart Oven Pro), we highly recommend the Quarter Sheet Pan from Nordic Ware (loved it so much we bought a second one) and an oven-safe baking rack for making those aforementioned crispy skinned – super fluffy baked potatoes. If you don’t own any small pans a toaster oven baking set is a great starting place. 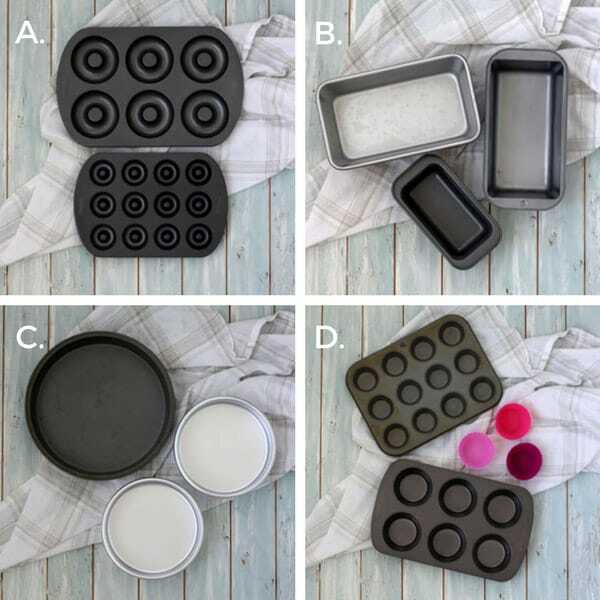 Most sets include at least one tiny baking sheet, baking pan and then some accessory like a baking/roasting rack, muffin tin or pizza pan. Unfortunately, their sizes and quality vary greatly. The Chicago Metallic Non-Stick 4-Piece Toaster Oven Set was our first toaster oven pan purchase years ago and we still regularly use the muffin tin and cookie sheet/baking rack combo. 15 Second Review: A pretty handy set that succeeds in most areas. Best Piece: The rack! 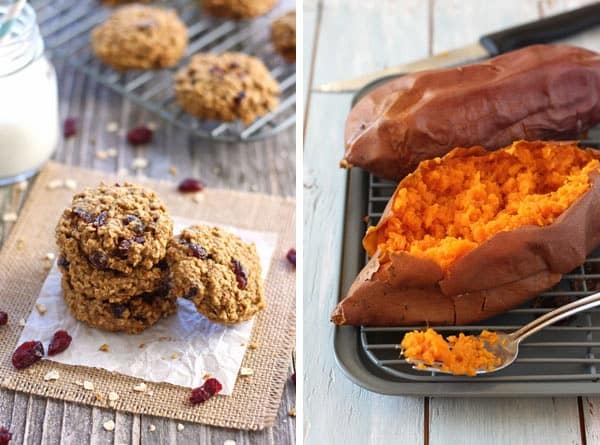 It’s fantastic for cooling a small batch of Cranberry Orange Oatmeal Cookies and keeping Baked Sweet Potatoes from getting soggy. The rack is also designed for use in both the baking pan and cookie sheet. Worst Piece: The cookie sheet. It’s too small to use a toaster oven silpat with and the light-weight metal causes it to warp at any temperature. Its shape does return to normal after cooling and when used with the rack it will stay weighted down and warp less. Would We Buy Again? Yep, we would gladly pay the low purchase price just for the cake pan, muffin tin and rack so even with the lackluster cookie sheet we consider it a good value. We bought the Farberware Nonstick Bakeware 4-Piece Toaster Oven Set specifically for the non-stick cookie sheets that were just slightly larger than the one included in the Chicago Metallic set above. 15 Second Review: A heavy-duty pan set that could use a few extra pieces. Best Piece: Originally we were torn between the cake pan and the pizza pan because both are made of a heavy-duty metal that performs well at higher temperatures. 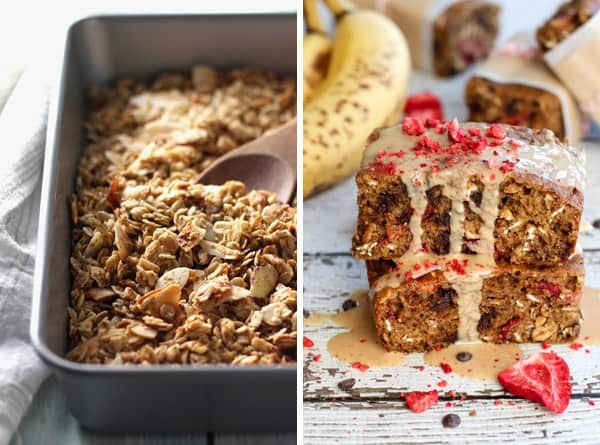 After two years we definitely use the cake pan more, especially for making small batch almond granola and over the top Strawberry Chocolate Chip Banana Bread Bars. Worst Piece: It’s the cookie sheets again! Sometimes they warp, sometimes they don’t. 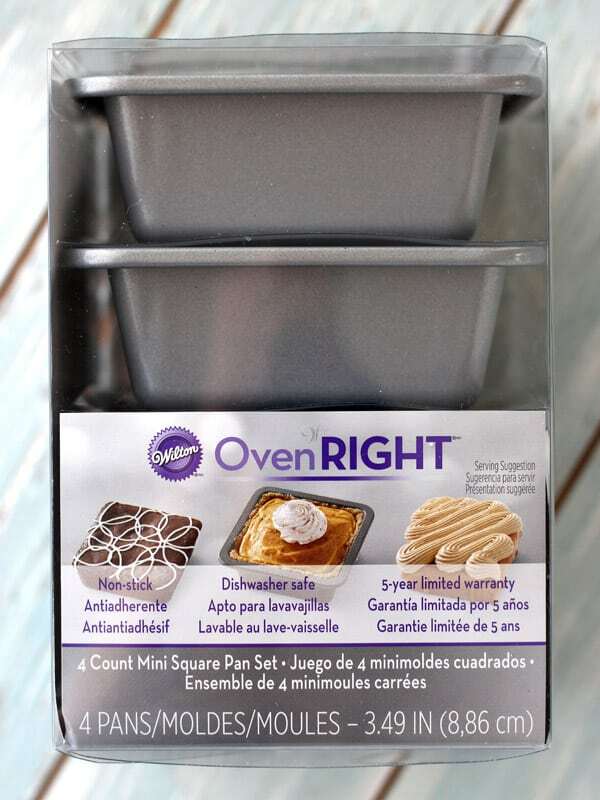 It would be nice if the set included a rack or muffin tin instead of two cookie sheets since you can only use them one at a time in a small toaster oven. 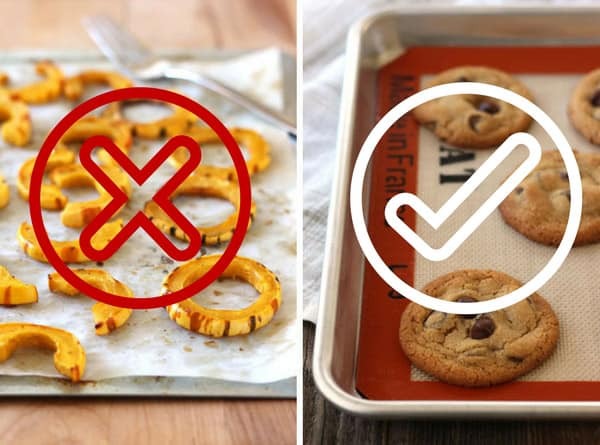 Double Up Tip: If you have this set, try doubling up the cookie sheets. We’ve had good success making our Toaster Oven Veggie Nachos without any warping by stacking one full pan on top of the other empty pan. Would We Buy Again? Yes, but with the hopes they’re working to improve the cookie sheets so they consistently perform without warping at higher temperatures. 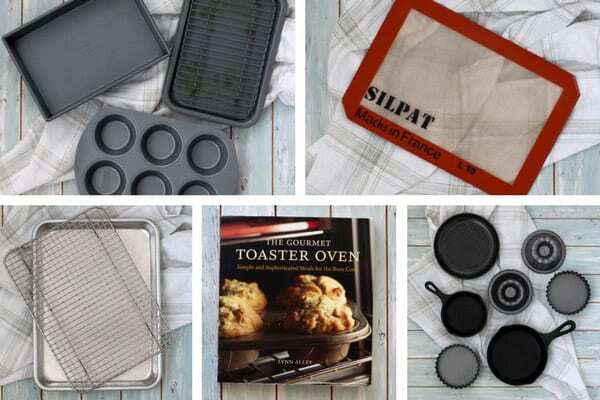 Second to a quality baking pan, a Toaster Oven Silpat will help you bake the best tasting cookies and pastries. They’re completely non-stick meaning you won’t have to oil or grease your cookie sheet. Depending on the brand, toaster oven silpats can withstand temperatures up to 480° Fahrenheit. 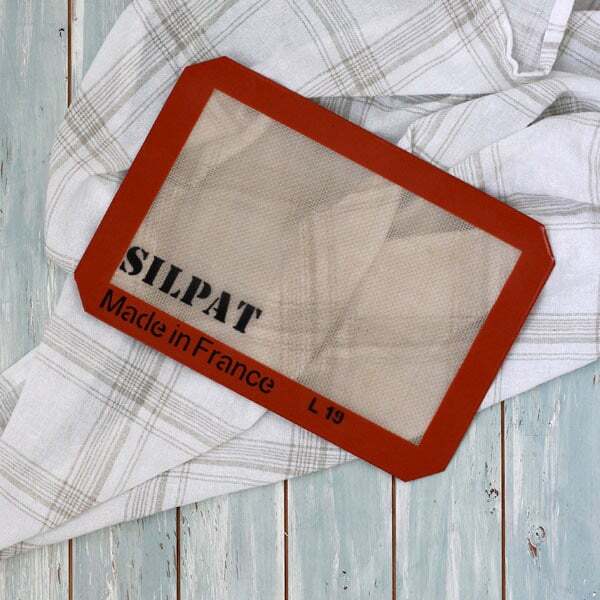 You can wash and reuse a silpat repeatedly so they’re also environmentally-friendly. *An awesome reader named Paula pointed out that her parchment’s box stated it should not be used in a toaster oven. Sure enough, ours did too. So we no longer recommend using parchment paper. Most are too large for smaller toaster ovens and too big for the cookie sheets in toaster oven pan sets. They can retain oil and stronger odors like onions and garlic. Some reviews complain of the rubber edges degrading over time. From Jalapeño Pumpkin Cornbread Donuts to a deep dish mini Lemon Blueberry Skillet Cookie there’s no end to what you can create in your toaster oven using these specialty pans and skillets. 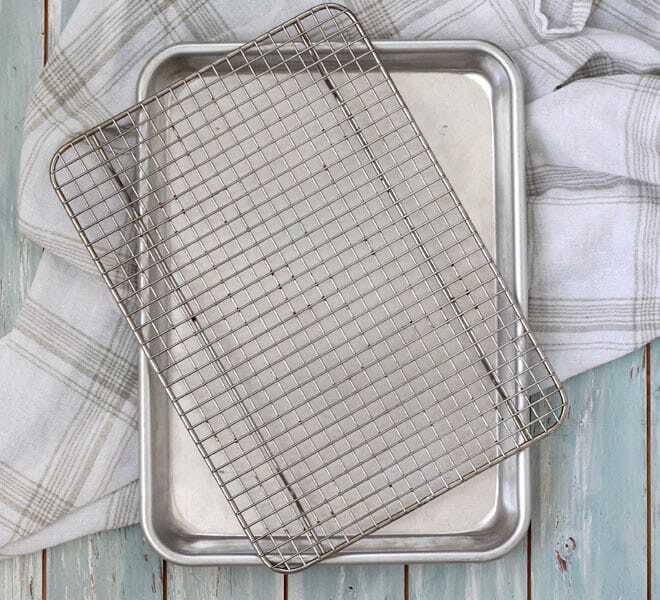 These square metal pans from Wilton are perfect for baking Toaster Oven Carrot Cake and individual casseroles. Each pan is 3.49 inches and can hold up to 8 ounces. We were able to fit all 4 pans in our Breville Smart Oven Pro and 2 in our tiny Oster TSSTTVVGS1. Wilton also makes a 4-inch round mini cake pan set. Even mini skillets require a little extra attention. 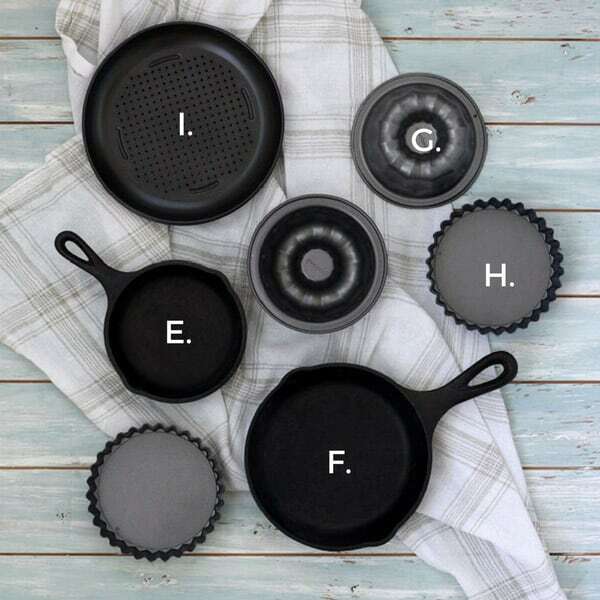 To make sure your skillet is always rust-free and ready for any recipe check out this great tutorial on how to care for cast iron from Rachel at the Country Contessa. 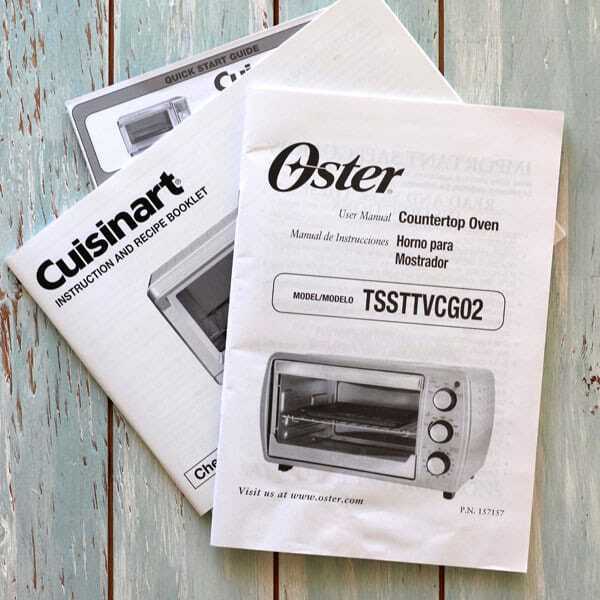 If you’re looking for a bunch of recipes sized for your toaster oven there are a few toaster oven cookbooks available. Our library didn’t have any toaster oven cookbooks so we purchased the two below from Amazon as used copies for less than $10 each. 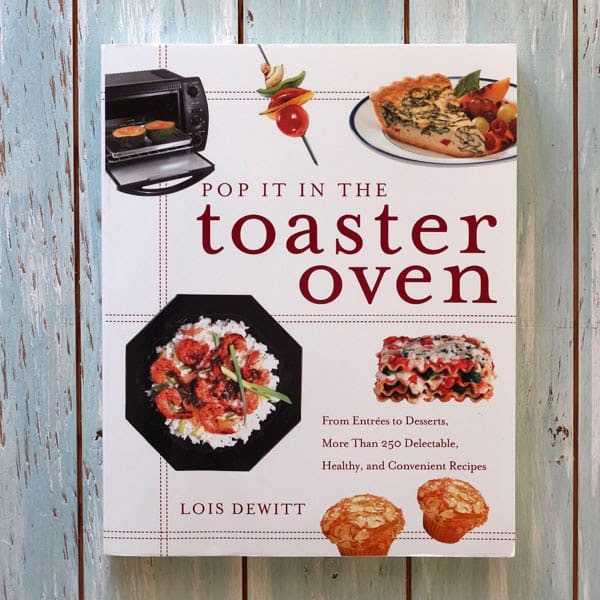 Boasting over 250 recipes, Pop It In The Toaster Oven By Lois Dewitt has to be the most comprehensive toaster oven cookbook available. Meat-eaters will appreciate the chapters dedicated to Poultry, Meat, Fish and Seafood while there’s still plenty for Vegetarians to enjoy with chapters on Pizza, Vegetables, Grains, Breads and Fruits. 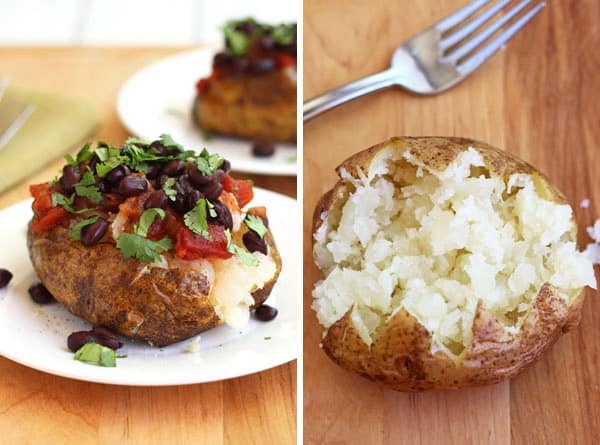 Not-So-Great: Unfortunately, there are no pictures and all of the recipes/ingredients have a strong low-fat aspect (ie. margarine). With a little tweaking though, I think most will taste great since it’s way easier to make a “healthy” recipe more indulgent than the other way around. 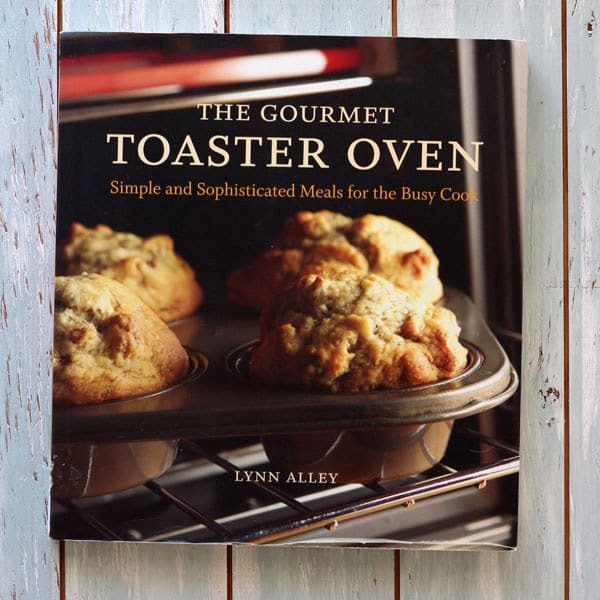 The Gourmet Toaster Oven By Lynn Alley is full of beautiful pictures for many (but not all) of the recipes. Almost all of the recipes have 10 ingredients or less with easy to follow directions and were tested using a convection toaster oven. The author has included useful notes in the recipe headers for recommended bakeware/brands and reheating suggestions. Not-So-Great: You might be a little disappointed by the amount of recipes (less than 60) and lack of variety. While there are a few basics like pizza dough and pie crust most live up to the “gourmet” title including wine pairing suggestions. 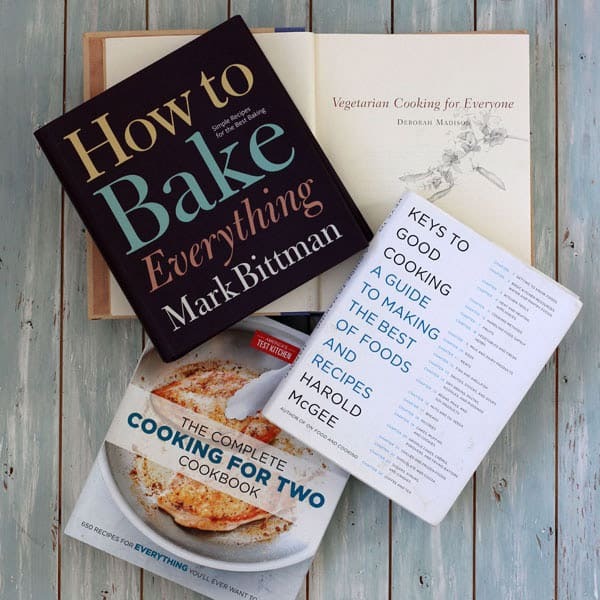 Neither of the toaster oven cookbooks above address basic kitchen skills or give guidance on experimenting with a recipe’s size or ingredients. These books do and you can probably find them at your library for free! America’s Test Kitchen Complete Cooking For Two Cookbook is perfect for anyone new to the kitchen. It’s full of simple and reliable small-batch recipes along with step-by-step photos for basic kitchen techniques like how to hold a knife or mince garlic. Vegetarian Cooking For Everyone should be called the Vegetable Encyclopedia. With a variety of ways to prepare any vegetable from A to Z you’ll have no excuse to not eat your veggies! Keys To Good Cooking – A Guide To Making The Best of Foods And Recipes by Harold McGee explains the science of cooking (The Why) in simple terms that anyone looking to experiment with creating small-batch toaster oven recipes will find useful. Well friend, we’ve covered the toaster oven essentials (and then some) so now I gotta ask…are you ready to make more than toast? Ooh, think I heard a YES! You can find all of our 100% Toaster Oven Tested Recipes here. If you’ve got a question about our toaster oven essentials or just want to tell me one I forgot 🙂 shoot me an email or leave a note in the comments below. I’d have to disagree about the Faberware set. The rolled edges on the round pan sliced into my finger very deeply, and it was not pleasant. I contacted Faberware a few days later, and they said I’d need to provide “photographic evidence” to do anything about it. Sorry, Faberware, I was too busy with my first aid kit. Also, the surface inside that rolled edge rusts like crazy! That sounds like a terrible experience, Carrie. We’ve had our pan set for 3 years now and use all of the pieces regularly without a problem, maybe you got a bad pan? I think we did have an issue with rusting the first time we washed the pan because we stuck it in the dishwasher. It seems like all the mini pans have tiny edges that are prone to rust, ever since we started washing our metal pans by hand that hasn’t been a problem. Thanks for stopping by and if you have a pan or set of pans you do enjoy using in your toaster oven I know our readers would love to hear your recommendation! i notice you do not mention using ceramic for cooking in the oven-i really do not like the dark pans for cooking meat- i use them only for baking purposes. We’re working on a follow up to this post that’s going to be focused A LOT on ceramics and stoneware. Since you mentioned cooking meat, do you have any favorite dishes you use? My husband and I aren’t really meat eaters so we don’t have much to offer on the subject, I’m sure MANY readers would LOVE to hear about any pans or dishes you’ve had success with in your toaster oven. Very helpful article. What I’m trying to find is a technique or tool for removing hot dishes safely. Any advice for the small clearance in a toaster oven? Recently, I saw these heat resistant gloves at Sur La Table (though I’m sure you could find similar kinds of gloves other places too). They have grippy silicone on the outside and because the design is a glove not a mitten you can really use your fingers to grip pans. The cuff is a nice touch too, since it’s so easy to accidentally bump your wrist on the top of the toaster oven while getting pans out. Something like this cake pan that has wider handles to grip is another idea. Though the size of your toaster oven may limit your options since the handles will add to the pans overall size. If using a lighter pan would make cooking easier, silicone bakeware might be something to consider. 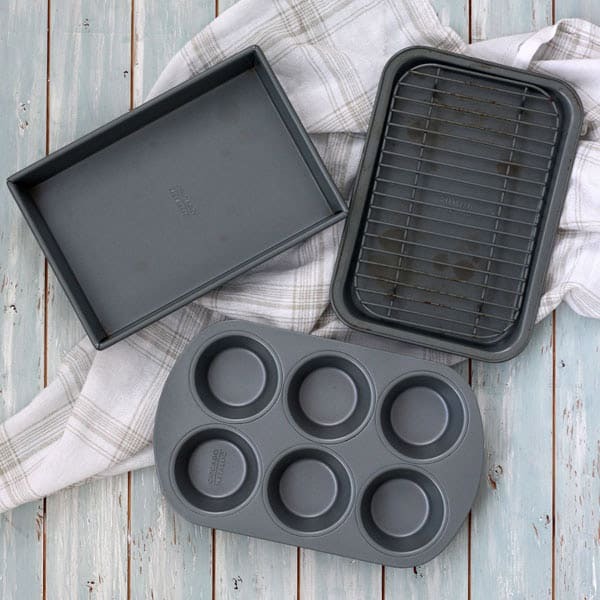 Aside of the little silicone baking cups, we haven’t tried any other silicone bakeware in our toaster ovens so I can’t speak to their safety/performance but maybe others who’ve used silicone baking pans will chime in? Hey, I have a large-but-not-huge toaster oven, the FBC2 Krups convection model. It’s not sold anymore, and trying to find pans that take advantage of its size seems to be nearly impossible. It came with a weird 2-level pan and a crisper/broiler pan, which are 10 1/4″ x 11 7/18″ x 1. (As far as I can tell, they never manufactured a proper cake pan or anything else.) So the big 13-inch pans would be too large, but the more common 10×7 pans are awfully small. I’ll definitely pack a measuring tape and trawl my local HomeGoods for potential items, but does anyone have any other suggestions? Thanks! I couldn’t find the interior dimensions for your specific toaster oven online but based on the pan sizes you mentioned there are a few options you might want to consider at Sur La Table. If you’re looking for a new baking sheet they have quarter sheet pans with unique dimensions. This one is 10.94 x 9.63 x 1.13. If you can go a little larger than the pans that came with your toaster oven, this one is 12.25 x 8.13 x 1. 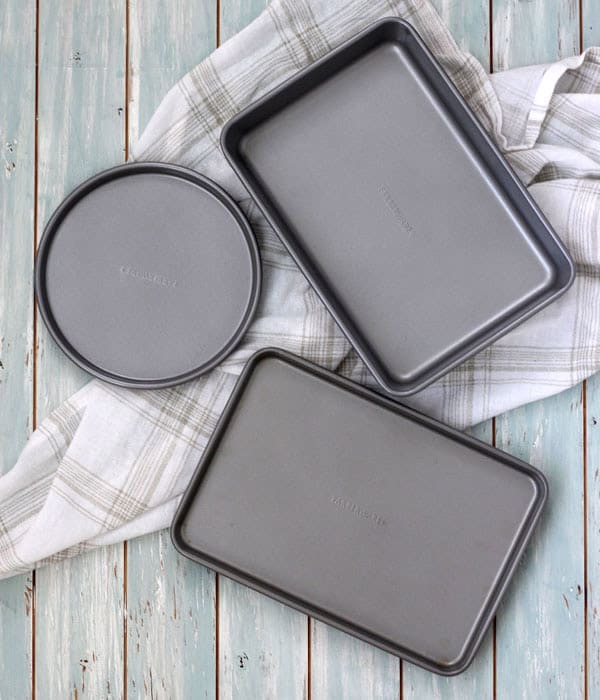 If you’re looking for baking dishes an 8 x 8 is a good all purpose pan but if you want to go bigger I would keep my eye out for something like the large stoneware baker in this set, it’s 7.75″ x 11.5″ x 2.5″ with a 3qt capacity. What’s nice about that dish is that it doesn’t have handles, those darn handles are why a lot of good-sized baking dishes end up not fitting most of the time. 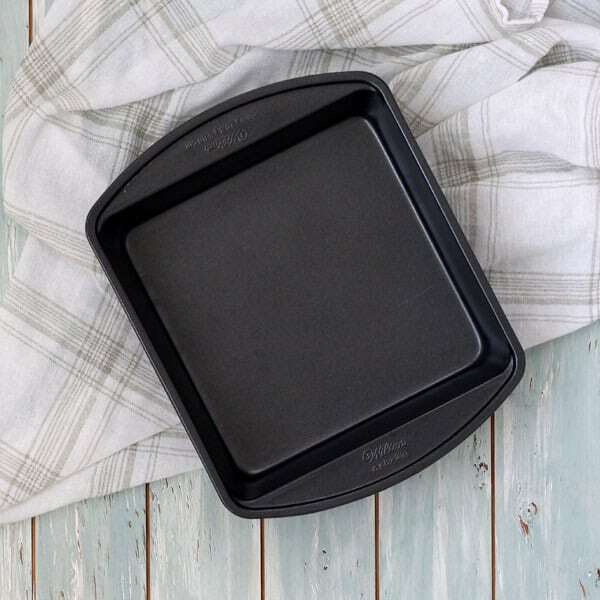 This 10.2″ x 2.4″ round baking dish is a little pricey but also a nice option. CorningWare also makes an 1.5qt oval casserole dish that is 11″ x 8.5″ x 2″ in their French White Collection that might work for you. Carrying a tape measure is a great idea, I have a mini one packed in my purse at all times 🙂 found it at the checkout area in Home Depot. Hopefully, other readers will have some great pan suggestions too! Thank you for the suggestions and all the details! I really appreciate it. I’ll look into your suggestions! Those all sound pretty good. Hi Brie! Ok so do you have a blog post about your favorite toaster ovens. I’m looking to upgrade to a better toaster – any recommendations would be great!! Right now, our main toaster oven is a Breville Smart Oven Pro and we love it. There are a few drawbacks, like a very loud beeb/alarm and it’s huge but those are tiny compared to how versatile and super accurate/consistent the cooking is. We like to only recommend toaster ovens we have used personally (which is a small list) but this post from The Sweethome has great reviews of the best toaster ovens in 2016, scroll to the bottom and you can see all of the toaster ovens they tested, not just their Top 3! I actually made cornbread and it came out perfect. My question. Are there any web sites or recipes specific to a 7 X 11 pan? Most casseroles are for a 9 X 13 pan. I’d prefer not to guess on cutting down a recipe. That’s a great looking pan, I bet your fresh cornbread was fantastic! We’re actually working on a conversion chart to help others fit different recipes into the pans they have on hand. Your 11×7 pan is very similar in capacity to an 8×8 pan, 9×9 pan and an 8-inch or 9-inch pie pan. So any recipe you find calling for one of those pans will work in your pan. You can cook the recipe at the same temperature but because your pan will make the dish a little wider (shallower) start checking for doneness earlier. Also, here’s a great post on Halving Casserole Recipes: http://www.thekitchn.com/halving-casseroles-tips-for-re-137981. I only cook for myself,I am not a good cook that can make something out of nothing,so where can I purchase pans ? Cooking meals for one is a lot easier using smaller dishes. There are many toaster oven baking sets available on Amazon and you can use the “red” links at the top of this page if you want. Also, you can find toaster oven baking pans and smaller dishes at many home goods stores like Ross and Marshall’s. If there’s something specific you’re looking for let us know and we’ll do our best to help you find it.